A true photographic image of Joseph Smith Jr.: The Daguerreotype and Joseph Smith Jr. 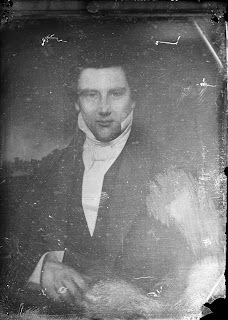 The Daguerreotype and Joseph Smith Jr. I wanted to create a time line of various historical references that would pertain to a daguerreotype of Joseph Smith. 1840 – While in Philadelphia, Joseph Smith Jr., stayed only a mere couple of blocks from a budding daguerreotypist by the name of Robert Cornelius. Mr Cornelius, a lamp maker, had received written instructions via Louis Jacques Mandé Daguerre’s 1839 pamphlet by the title “An Historical Account and a Descriptive Account of the Various Processes of the Daguerreotype and the Diorama”. Robert Cornelius later became known as one of the most prominent American pioneers in this field. Word of this exciting new art form quickly became that talk of the town, especially in Philadelphia. Most scholars are in agreement that this new invention would have definitely drawn the interest of the LDS Prophet. Unfortunately, not much is written about Joseph’s time in Philadelphia, so we are left to examine a second-generation photo and compare it to the daguerreotypes of this time period and the work of Mr. Cornelius. To the right is a photo Robert Cornelious (1839), below that is an example of his work from May 1840. 1. A shallow depth of field. Much of Mr. Cornelius’ early work shows this in abundance. A short focus (shallow depth of field) allowed for a shorter sitting time when a portrait was being created. 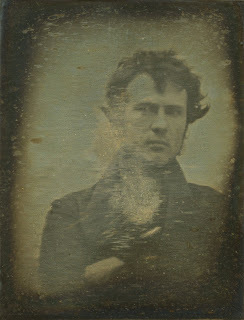 At that time, scientists believed that the daguerreotype process could not be used for anything other than “stills”, but Mr. Cornelius proved them wrong with a daguerreotype self-portrait he took of himself in 1839. To early photographers the bokeh (area out of focus) was considered a defect and undesirable. Through the 1840’s the entire daguerreotype process quickly progressed as well as the skill and knowledge, hence sharper and higher quality images. Early on in my research I sought the advice of a well-known and highly educated “photo detective” and asked her opinion in regards to my photograph, she informed me that “All daguerreotypes are sharp in focus and anything but that is not a daguerreotype photo”. At the time I had a much more naive understanding of the process but yet her statement did not make sense. Now, I truly understand how completely generalized her assessment was, she apparently did not even understand the basics of photography or its early evolution. 2. A flat plain backdrop, most likely gray or off white in color and made of canvas. As photography developed so did the backdrops and settings they were used in conjunction with. Some of Cornelius’ early work shows the use of a very similar backdrop. However this specific detail of the image is not exclusive to Robert Cornelius or the 1840 time period but if in contrast it could conceivably rule it out. 3. Evidence of an outdoor photo-shoot. This theory is based on the high, small circular catchlights that appear in his eyes as well as the sharp shadows under his nose, chin, and collar. Most early daguerreotypes were produced in this method and again this detail of the image falls into alignment with some of the early work of Cornelius. 4. The lack of any type of inner oxidation rim or marking caused by a decorative mat, which would have sat directly on top of the polished image. 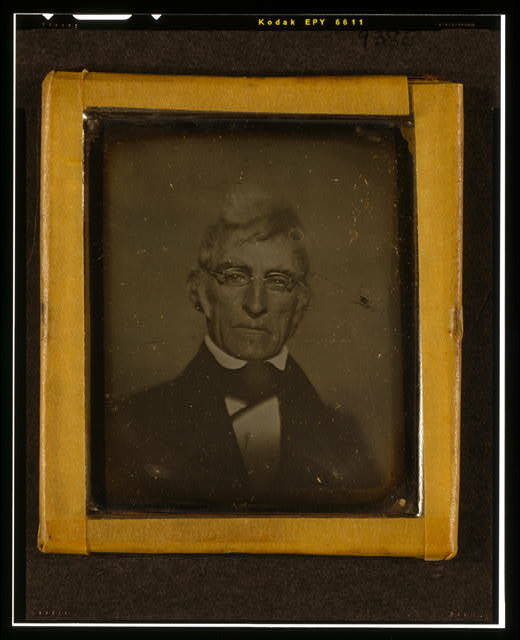 Many early daguerreotype photos do not have mats or if they do they are very plain and square in design. As the photographic art progressed so did the cases, mats, and preservers. Almost all daguerreotypes that have managed to survive until now have a heavy ring of oxidation that occurs around the outside edges as well as along the edges of the mat. I might note that my image shows a dark rim around the outside that is embedded within it and is not a result of the paper aging process. I think it is reasonable to say that it is comparable to the oxidation that could have occurred to a daguerreotype that aged thirty to forty years but there is not exact science to determine this. The initial preparation, process and aging environment play such a heavy role in shaping such factors as these. Again the image of Joseph cannot be ruled out and becomes comparable to the daguerreotype specimens of 1840 that are attributed to Cornelius. 5. Blown- whites that create a halo-like effect around the figure as well as lack of detail in the shirt and cravat. For early daguerreotypists not overexposing an image was very tricky, a planned expose for a portrait was usually calculated for the face, not the clothing or the background. This is especially seen in some of Cornelius’s first daguerreotypes. This imperfection is still seen today in the work of amateur photographers but occurs significantly less due to technology. I do also want to point out that the RLDS painting of Joseph Smith has been photographed many times and I have yet to see an example of the whites being overexposed. Another thing that is interesting, is the extremely smooth appearance of his face, possibly a result of the overexposure or maybe something else. In 2009 when we did our initial high-resolution scan of the photograph at Borg Photography, reporter Barb Smith of ABC4 news was in attendance and stated upon seeing the photo enlarged that he (Joseph) looked like he was wearing makeup. Interestingly, I read recently how early daguerreotypists used flour as a face powder in an effort to match other light tones being photographed and create a better exposure. 1843- A traveling Daguerreotypist by the name of Miller took “a miniature” of Wilford Woodruff in Nauvoo as noted in his August 28th, 1843 entry. This could have sported an opportunity for Joseph to be photographed. 1844 – Daguerreotypist Lucien Foster arrives in Nauvoo on April 27th, 1844; two days later he meets with Joseph Smith Jr. as recorded in Joseph’s journal. Many have noted that the Prophet made no mention of ever sitting for a Daguerreotype, but in using healthy reasoning, the possible omission could be easily justified. It was a very a turbulent time for the man and the plausibility of various events not making it onto the pages of a journal are easily understood. The void of such a reference could never be exclusive proof of its lack of existence. An example of that is my grandmother, she was an extremely prolific writer, especially in regards to her personal journals, there are numerous volumes from her life, but she definitely did not record every eventful experience that one might deem significant. Lucien Foster wasn’t just within close proximity to Joseph; he rented a room in the Nauvoo Mansion and was on his presidential campaign. After the Prophet’s death he ran an advertisement in the Nauvoo Neighbor, dated August 14, 1844. L.R. FOSTER, is now prepared to take Likenesses, by the Daguerreotype process, in the most beautiful style of the art, either plain or coloured, at his Daguerreotype Rooms, on Main Street, a few rods above Ivin's Store. By this wonderful process, which is a combination of nature and art, a more correct and beautiful likeness can be obtained, than by any other method which had been known to man. An image of the person, as exact as that formed by a mirror, is transferred to, and permanently fixed upon a highly polished silver plate, through the agency of an optical instrument. Only two or three minutes are required for the operation. The discovery was made by a Frenchman named Daguerre, (hence the name Daguerreotype,) and has excited the wonder, admiration and surprise of every one, upon first beholding the effects of the art; and such is the beauty of the work, and so perfectly to the life is nature shown up in her every lineament and feature and expression, that each succeeding specimen serves only to increase but not to satiate these emotions of the mind. How valuable or rather invaluable, would be such a likeness of an absent or departed friend. Price only three dollars, including a handsome morocco case. Instructions in the Art, given upon reasonable terms, and Apparatus for sale. Lucien Foster referred to specimens at the Nauvoo Mansion. What were these images of that they needed to be viewed there instead of at his shop? We do know that in early months of 1845, Lucien photographed Emma with her young son David, who was born on the 17th of November, 1844. I might add that her photograph has an arched-shaped mat as well as the residual oxidation from that interior shape. 1852- A Daguerreotypist named William A. Smith (also known as Amor de Cosmo) operated a photography studio in Kanesville, Iowa. On May 13th he ran an advertisement in the Kanesville Frontier Guardian and the Iowa Sentential. May be seen at the Smith’s Gallery. Pictures of all kinds copied. Some researchers believe that the images of Joseph and Hyrum were most likely a copied from paintings of the two men. What their argument in regards to this is unknown to me. Nowhere in the advertisement does it refer to these images as being derived from artwork. We do know that it was a common practice for Daguerreotypists to copy daguerreotypes via another photograph. There was no way to duplicate these one of a kind images other than re-photographing them. We also know of at least six daguerreotypes that were taken of the Nauvoo Temple before it was destroyed in 1848, so the advertised image was likely copied from an original source. I might add that one of those photographs of the temple is believed to be taken by Lucien Foster. 1879- On April 30th, Emma Smith passes away at the age of seventy five. It has been said that in the last years of her life she was quite protective of her images of Joseph and only allowed a select few to view them. On the 27th of June, Joseph Smith III sent a letter to a John A. Robinson, husband of Mrs. Robinson, a photographer. Do you remember the question about father’s picture? If so, are you and Sr J.A. still desirous of going into it? I have intended all along to come down, but can’t see the way clear just yet. If and so have determined to send the pictures to you for a trial, if desired…. My step father Mr Bidamon wants to sell the pictures and with this exception and what we might sell here at the office. You can have sole sale of them; and the exclusive manufacture of them, if we can agree as to terms, after we see whether they will copy well. It is the only picture (real) of father in existence. Not so many of mother’s would be wanted. I think there is a good bit of money in it for someone; and Sr Robinson and you may as well get it as anyone. Clearly, Joseph’s statement of “It is the only picture (real) of father in existence”, is not a reference to a painted image because he would have known his father sat for more than one painting. It is clearly in reference to a specific and singular image. The question of whether “they” would copy well appears to be more relevant to that of the difficulties in copying daguerreotypes. Joseph also states his wish to send multiple pictures, not just a singular picture. These multiple images could have easily been a combination of photographs as well as artwork. The right whereof he claim I as proprietor, in conformity with the laws of the United States respecting Copyrights. Here’s where it gets interesting, it wasn’t until the 1860’s that photographers could copyright their portrait work. Up until then, if you were photographed, you owned the copyright to the image. Unlike the modern laws of today, when you or a family member is photographed, you can buy a copy of the image but the photographer owns the copyright to the image as an artist of that image, though he/she may not have the right to distribute it for sale without your permission. Early photographers were not considered artists but more like technicians that delivered a product of reproduction. So why did Joseph Smith III copyright his father’s image? Clearly there was an intention to reproduce images for distribution in the effort to create revenue as stated in his letter to Mr. Robinson. If Joseph had an original daguerreotype of his father and copyrighted it, in actuality that copyright protected against any type of reproductions and perhaps he hoped this would encircle the RLDS painting as well as other artistic renditions of the image. If he could prove that the artist used a copyrighted photo of his father to create a painting or drawing from, he could have exclusive control of his father’s image. On August 15th, The Saints’ Herald ran an advertisement listing for sale, various sized photographic copies of the famous RLDS painting of Joseph Smith Jr.. To some researchers this is proof positive that Joseph Smith III had his father’s image copyrighted so he could sell this specific image exclusively. To this I refer back to the copyright laws of 1879. All copyrighted materials for distribution and sale must have the copyright information displayed in plain view. 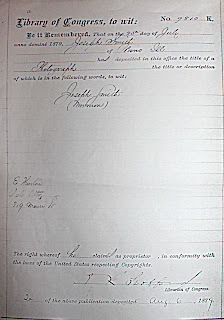 Through all of my research I have yet to find a copy of the RLDS painting with Joseph Smith III’s 1879 copyright on it. As a matter of fact some antique postcards of the painting clearly refer to the RLDS painting as an original source. You can see an example of this on the website photographfound.com, which is written and ran by some great researchers named Reed Simonsen and Chad Fugate. The image below is a comes from a glass plate negative of a daguerreotype of the RLDS painting. The negative at one time was apparently a very clear and detailed image. Why am I showing this to you? The Saints’ Herald advertised large solar prints of the painting upon request. Only a highly detailed negative could produce such a large and detailed print. The RLDS painting apparently had no problem being photographed even in the days of the daguerreotype. Clearly the albumen of Joseph Smith Jr. submitted to the Library of Congress was not of that caliber and detail, which might offer an explanation to the initial hesitancy in sales of that particular image. In defense of this theory I will also point out that the photographer, Mrs. Robinson, enlisted the help of an albumen-photographer by the name of William Carson. It was with Mr. Carson’s help that the photograph was edited, retouched, and re-photographed again. Why would they have this need if the initial negative turned out so well? Unless, we are talking about two separate images that were photographed for reproduction and sale, one a copy of a painting, the other a copy of a difficult to photograph daguerreotype. Another thing I might point out is that in the early history of photography, a daguerreotype was not always considered the most flattering image. Many patrons were displeased upon receiving their images from their Daguerreotypist. Sometimes an artist rendition was preferred and most good artists of the 1800’s were in the habit of beautifying through subtle corrections. So, another theory is perhaps Joseph Smith III and his step father Lewis Bidamon preferred the painted version instead. There are some skeptics that point out the advertisement referenced the name of Joseph Smith Jr., not Joseph Smith III, and it was virtually impossible for Carter to have ever met the first Prophet of the Mormon Church but that can be attributed to a simple misunderstanding. Various times through my research I have seen where Joseph Smith III was referred to as Joseph Smith Jr. One of these references came from an online source via a photo album of his adopted sister named Julia. Underneath his photograph was written “Joseph Smith Jr.”. Another thing perplexing about the photograph was that Julia died in 1880, but the photograph of Joseph Smith III was taken by C.W. Carter. Perhaps it was taken when he came to Salt Lake City in the year 1876. Either way, that photograph definitely solidifies some type of relationship with Carter. Carter even reproduced and sold the image with Joseph with his son’s copyright attached, as he was legally bound to do. I think it is quite reasonable to believe the two men came to some type of mutually beneficial agreement. I am sure Joseph knew that Salt Lake City would be a productive market in regards to the sales of this particular photograph. What becomes confusing is three drawing show up with copyrights that same year (1885), all say they are “copied” from a daguerreotype taken at the city of Nauvoo in 1843 and are copyrighted in C.W. Carter’s name. One of the images is the work of a popular Utah artist named Danquart Weggeland. In no way is C.W. Carter proposing that all four images were all in the same, when they clearly were not. 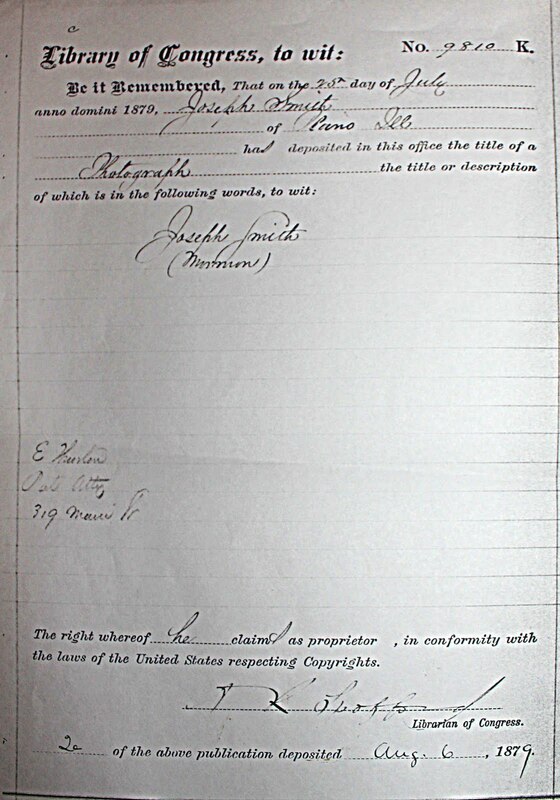 The three he copyrighted without a doubt were artwork and the word “copied” in this instance was the term he used to express a reproduction via an artist’s eye. No Indian ink was used to block out the background and define the hairline as the “Carter” and the “Library of Congress” images display. Why Carter choice to have the drawings done is a mystery. Perhaps he came to some type of agreement with Joseph Smith III and wanted to have a variety of images to reproduce and sell. One thing I thought about was how Joseph Smith III, spoke of coming to some type of agreement with the Robinsons pertaining to the exclusive sale and manufacturing of the images brought to them. Perhaps Carter, had to find a different product to sell because the Robinsons were promised exclusivity. Danquart Weggeland drawing for Carter. 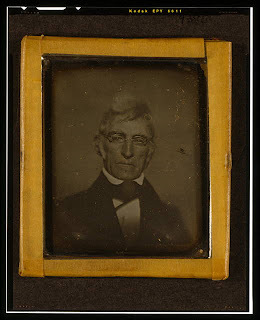 Over the last century and a half a flood of various artistic renditions have come forward, almost all citing a daguerreotype of Joseph as the source. With this came a mass of confusion. The uneducated would refer to the reproduced drawings as actual photos of the late prophet. The word “copied” lost it meaning because it could refer to two separate and completely independent processes. It’s understandable but a bit too simplistic to say that if some are wrong in their definition, then all are wrong in their definition. I notice in your issue of Saturday morning, March 5, 1910, a copy of which was handed to me by a neighbor, a cut purporting to represent a life-sized portrait of my father, Joseph Smith, painted by a Utah Artist. I do not regret to see the picture, but I do regret to know that all the reverence said to be held by the people of Utah toward Joseph Smith, the first president of the church, they know so little about the appearance of the man. I regret the statement that is made, that there is no authentic picture of my father in existence, for this is a mistake. If your artist, Mr. Ramsey, should ever visit the capitol of Iowa, he will find a duplicate oil painting of Joseph Smith in one of the halls, placed there by myself and my son, at the request of Mr. Charles Aldridge, then curator of the historical society. There is an authentic oil painting now in the possession of my son. Frederick M. Smith, at Independence, Mo., painted by the same artist, that painted one of my uncle, Hyrum Smith, which has formed a basis of pictures of him since his family went to Utah. It fortunately happens to us that this portrait, painted in 1843, is sustained in its characteristic likeness to my father by the daguerreotype in our possession, taken the same year, I think, by an artist by the name of Lucian Foster. The picture in The Tribune looks like it had been made up of a composite of superimposed photograph, creating an ideal face. It represents him as wearing a ring on his right hand. The only ring he ever wore was worn on his left land. The picture represents a curly-headed man, but my father's hair was not curly. It was quite light in color and altogether the picture fails to essentially represent the man. That Mr. Ramsey has done well from the material which he had to work with, I can believe, but the expression about the lower part of the face, taken from the death mask, which I saw reproduced in Ogden, executed by one Brown, several years ago, gives too full prominence to the lips and chin. It is a pleasure to think, however, that the remark made by you under the cut, that the artist had given a human touch to the picture, may be true. The recollections of the man so far as Utah is concerned had been kept alive by flat side views, by pictures originally executed by Sutcliffe Maudsley, an English designer, and a good many of them are but caricatures. I am enclosing a photograph taken from the oil painting referred to. In reading this, I refer to various truths; one of them is that the RLDS painting of Joseph Smith Jr. does not an artist signature or completion date. 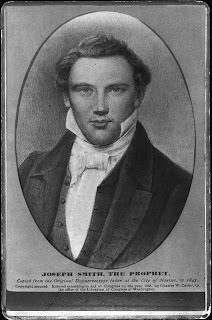 In a previous blog post I discussed the possibility of three different artists and only one of them (Rogers) was in Nauvoo in 1843, yet Joseph records sitting for a portrait with Rogers in September 1842 not 1843 and that painting is a profile image. So what was Joseph Smith III talking about as far as a painting that was done in 1843? Perhaps the sixty-seven years that had passed left room for error. 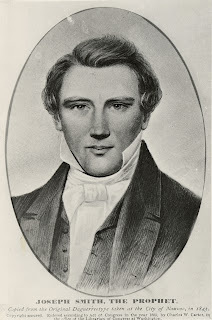 In addition, Lucien Foster did not come to Nauvoo until 1844, the year that the prophet died, but in fairness Joseph Smith III did not name him with complete certainty. In his letter to the Salt Lake Spectrum, Joseph, refers to the paintings as being “sustained in its characteristic likeness to my father by a daguerreotype in our possession”. In essence, we know the painting looks like him because we have a photo of him. It was Joseph’s goal to prove that the painting of his father was more accurate/authentic than that of Mr. Ramsey’s. Not once did he reference his father sitting for that painting but used his daguerreotype as the ultimate proof of his likeness. It would not make sense if Joseph said “I know the painting looks like him because we have a photograph of that painting”. I understand that it is easy to read something that is written a thousand different ways but he clearly stated he had a daguerreotype in his possession in 1910. Now the question arises was a daguerreotype ever taken of the RLDS painting? Yes, a copy of it can be seen in Ephraim Hatch’s book named “Portraits: A Search for the Prophet's Likeness", as well as in this blog. Did it ever belong to the Smith family? I don’t know but it is an incredible sharp daguerreotype image of a painting with no blown whites, no short depth of field, no “S” cravat pin, no button on the vest, no scars, no Esotropia, no plain blank background, or numerous other details that match my photograph. Back to 1879 when Joseph wrote the Robinsons, he refers to waiting to see if some of the images would copy well. Well apparently the RLDS painting had photographed just fine in days of the daguerreotype. 1992 - The Library of Congress photo of Joseph Smith Jr. is found in the archives. Most did not even know of it's existence until then. So now is the time to weigh the current evidence. Was a daguerreotype photograph ever taken of the once living and breathing man Joseph Smith Jr.? To date, there is no fragile daguerreotype to hold, to examine and test, but does this mean one never existed? Does a small 2 5/6” x 3 7/8” photographic print hold clues to its existence? A photo that shows a shallow depth of field, something only a 3D object could create, not a flat painted canvas. Does it mean anything that it sustains subtle details that are lost in edited 3rd, 4th, or 5th generation copies? I have had critics that have told me that what I have is and edited edition beyond that of Library of Congress or the Carter image but do you see a hand and cuff in bottom those images? I understand the conservative nature and skepticism that surrounds this subject as well as any historical document. Mark Hofmann forever changed the way these historical items were looked at, but amid all the fear of being deceived some truly incredible artifacts might go unrecognized. For your benefit or peace of mind I list the following details that would need to be included in a not-so-believable conspiracy theory. 1969 - My grandmother and grandfather receive a photograph of Joseph Smith Jr. while on their mission in Texas. On the back of the photograph is my grandfather’s name and their temporary address while in Texas, all written in his handwriting. Please note this occurred a few years before my birth. In 1981 my Grandfather passes away, I was nine. In 1985 my Grandmother crosses out his name, writes her name as well as “Property of” and a new current address. At this time she creates a scrapbook page with the photo as well as clippings from various newspapers. She photocopies this page and hands it out to some of her friends and family. It is also important to note that neither my grandmother, nor my grandfather were skilled in the art of photography or any art in that matter. 1991- My grandmother has remarried and is on a mission in California with her new elderly husband. She makes a reference in her journal in regards to a 16” x 20” painting her husband, an amateur artist with a shaky brush stroke, is working on. My grandmother refers to his use of her “Original Photograph of Joseph Smith copied from a Tintype” as a reference for Joseph’s likeness. (My grandmother would not have known the difference between a tintype and a daguerreotype.) Her husband does not put a cuff or hand in the painting for the sake of composition and my grandmother makes copies of the amateurish work of art and sends them out to various friends and family members. 1997- I come into possession of the photograph, from that time until present it has remained with me or within my access. 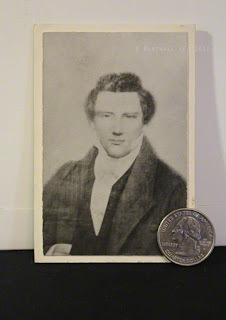 2009 – I read of the controversy about a photograph of Joseph Smith and my research begins. If there had been any type of conspiracy prior my grandparents receiving the photograph, you would think it would have manifested before now. Why would these so called conspirators, then give my grandparents a copy and lesson the value of what they had? The photo-like qualities of image would either have to come from an actual photo or someone who was trying to deceive the masses with these details. I have always told the LDS church that they could test the image fully as long as the process did not cause harm. I have also contended that why would someone go to so much trouble to create a 2ndgeneration print, why wouldn’t they have just created a daguerreotype and avoided the majority of the argument? In my efforts to be an honest human-being and not mislead any of my readers, I feel the need to tell you that I am not an active LDS member. I grew up in the church and left the church for reasons pertaining to my own personal belief system. I do not need this photo to “be” Joseph for any religious reason and my research has been one of more a historical interest and fascination. My grandmother was a Johnson; her great, great grandfather was Joel Hills Johnson, friend of Joseph Smith. My direct maternal line goes back to Rebecca Bearse Reed, a part Native American woman who became the nineteenth member of the Mormon Church. Her husband John Reed helped build Haun’s Mill and is said to have fashioned the key that let Joseph out of the Liberty Jail. Their daughter, my great-grandmother(X5) Clarissa worked in Joseph’s mansion and was married to Levi Hancock. While all of this does not give me pedigree that could absolve me from committing any criminal act, it shows my true motivation. I love genealogy, I love hearing something new about my heritage, and an alignment with the religious beliefs of my ancestors just doesn’t matter to me. I have given this analogy when speaking of photograph to help my LDS friends understand my perspective. If you had a photo of Abraham Lincoln, your grandmother worked in his house, another grandparent was his friend. Would you not research it? Do you need to be the same religion as Abraham to do so? Do I think photo has value? Of course, to many it offers a photo of their beloved Prophet but to others a historical figure that shaped America. Thank you for all the time and research you have put into figuring this out, and for sharing these high quality photos here on your blog. It is so cool to read and see. I disagree that image https://4.bp.blogspot.com/-sc8C2yTeC7s/TdtoKtCY-eI/AAAAAAAAAJI/D79995Zm1AM/s320/Negative+of+Joseph+Smith+painting..jpg is from a daguerrotype of the RLDS painting. Reasons include (1) the daguerrotype would have grown an extra hand, (2) the dag would have lowered the collar on our right, (3) the background in the dag is more distinct and shifted around, (4) the nose is bent and the lips asymmetrical in the dag, (5) the arm on our left in the RLDS has lighting to contrast with the background but not in the dag, (6) the cuff appears more crisp and stylized in the RLDS, (7) the hairlines are not the same, (8) the ears in the dag are showing less, (9) the hand on our left is more stylized in the RLDSthe dag is more natural-looking all around. Thanks for all your work. This is very fascinating.